Why Should I Gift Aid? Home » Giving & Stewardship » Why Should I Gift Aid? Gift Aid is a tax relief where the chancellor gives to charities an extra 25p for every £1 donated. If you Gift Aid your giving to Hope Church, the taxman increases the size of your gift by a quarter, and the church can do more to advance the kingdom. How Do I Gift Aid? 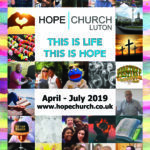 or take one from the Info Point Shelves and fill it in and email it to: finance@hopechurch.co.uk or post it in the Offering Box.